The second movie opened with takings of $253M globally. 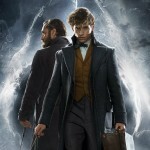 In the U.S. the film scored the lowest U.S. domestic office opening in the history of J.K. Rowling’s Wizarding World franchise, taking only $62.25M, 16% below the opening weekend of Fantastic Beasts and Where to Find Them. Overseas the film performed a little better with a $191M international launch, and improvement on the $186M international opening of the first film in 2016, and outperforming FB&WTFT in 43 of 79 countries. Its most successful debut was in China, where the film grossed $37.5M (still below the $41M Chinese debut of the first film). In other good news, Crimes of Grindelwald debuted top of the UK box office, ahead of Benedict Cumberbatch’s take on The Grinch. Taking £12.32M on opening weekend in the UK, it was behind only Avengers: Infinity War (£21.1M). Internationally, the film has dominated box office sales for three weekends in a row, taking another $40.2M from 80 territories over the past weekend. So far Forbes reports that Crimes of Grindelwald has grossed $500 million globally, with $385.3 million from foreign territories (Japan ($7.4M), Germany ($4.5M), France ($3.5M)). Crimes is yet to beat the $814M global grossing of the first film, but with mixed reviews and a score of 39% on the Tomatometer and average rating of 5.3/10 from 260 critic reviews on Rotten Tomatoes and a score of 53% on Metacritic, the future grossing of the franchise looks uncertain. “So, the first one went one way, this went a different [way], exploring more stories. Let’s get deeper, let’s bring the connective tissue. And it wasn’t because the audience will like that. It’s, this is what the story is, as we go further, and as we move on, as the timeline moves on, it gets closer to when Potter begins. So, some of the connective tissue becomes more overt. He also says the film will begin production roughly around Summer 2019, and that he knows the title of the next movie – according to him, the films will continue along the naming theme of ‘Fantastic Beasts: …..’. Would the Crimes of Grindelwald have grossed better if not for the free Fan First screenings and the #ProtectTheSecrets campaign not really protecting the film and fans from external reviews and spoilers? Are the lower numbers merely the fate of a sequel film? Will the third film gross better? What do you think the box office numbers tell us? Let us know via Facebook, Twitter and Instagram, or in the comments below, and read our interview with David Heyman here.